Check out the yacht that cruised into one of our harbours here the other day! This is in Gunboat Bay in Pender Harbour, on the Sunshine Coast of British Columbia. The plain fact is that the yacht couldn't have gone any further because the ocean narrows at this point (towards the foreground) and the yacht was so enormous, it couldn't possibly have fit through the gap. I was down by the ocean photographing the clouds above the harbour when the yacht motored into the middle of the bay and deployed its anchor with a tremendous splash. 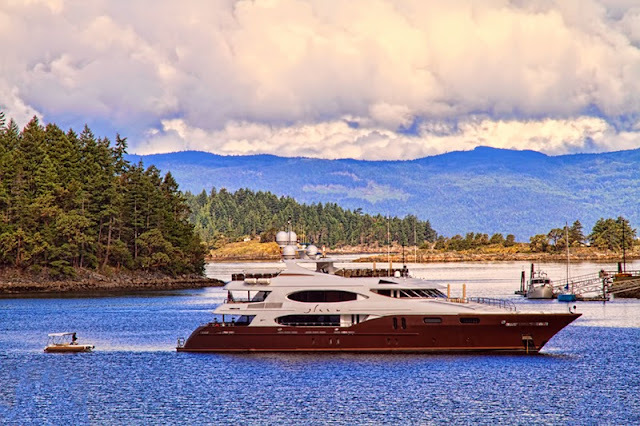 The lucky passengers spent the night onboard the luxurious yacht, surrounded by the magnificent mountains, islands, and coastline that make up Pender Harbour. They were gone the following day. I'd love to know who owns this beauty so if you have any ideas, please let me know. Apparently she's registered in the States and changed owners last year. She also had a name change, from "Glaze" (which you can see on the side of the yacht) to "Just Cause". Once when I was living in Seal Cove, Maine, this yacht came in for the night and it had its own security team that circle around the boat at all times. Must have been some really, really big shot. The boat even had a helicopter on it. Wow, it must've been huge! I'm curious whose yacht that might've been. The security team makes me think of someone in government but who knows? Thanks for your comment, Edward! Where Have the Hummingbirds Gone?